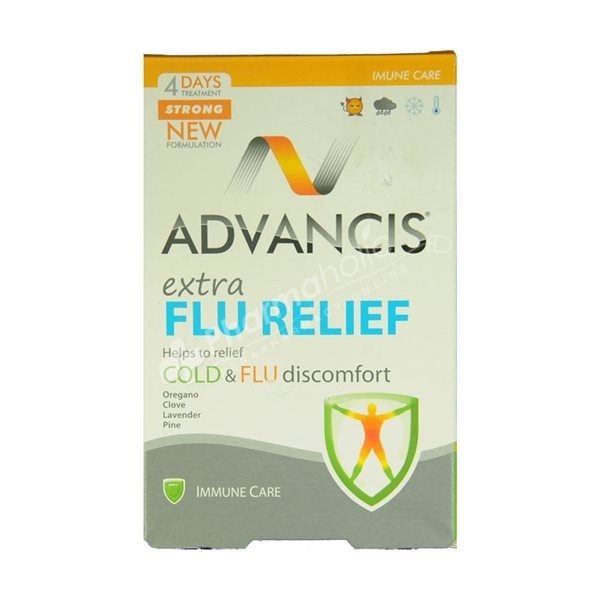 Advancis Extra Flu Relief is a food supplement, in capsules, composed by a complex of essential oils, namely, Oregano, Clove, Lavender and Pine. This association helps the body in the defense and resistance against the winter-related ailments, like colds, flus and other infections. During the first two days: 1 capsule after breakfast, lunch and dinner. After the second day: 1 capsule after breakfast and dinner. Gelling agent: Microcrystalline cellulose; Anti-caking agent: Tricalcium phosphate; Lactose; Essential oils of: Origanum vulgare 9,6%; Lavandula spica 9,6%; Pinus sylvestris 9,6%; Anti-caking agents: Silicon dioxide, Magnesium stearate, Magnesium Silicate; Gelatin.